do you prefer canning salt to urea? it's tsp=teaspoon correct? Yes because canning salt is cheaper and works the same. tsp = teaspoon. You're welcome. Does it hurt the glue if the salt is iodized? According to a Danish regulation, most salt is iodized to prevent people form getting struma (don't know the English word for the disease). I use canning salt based on Don’s recommendation. It’s because of the presence of iodine and other additives like anti-caking agents in common table salt. The more ingredients there are in the mix, the greater potential for adulteration. If non-iodized salt is not available to you, don’t worry too much about it. It is readily available and cheap in the US. How long do you let it set up after assembly? I leave it overnight. I wouldn't strain the joints for at least 24 hours. Does it need to be refrigerated to keep for a month? Or is that shelf life? No need to refrigerate for a month's time. I leave it over night in the coolest corner of the shop if it's been around a couple weeks but I try to use it up within a week or two anyways. Thanks Joshua, this is very helpful information. A few quick questions...if using urea, what are the proportions that you recommend? I've read that the additives weaken the strength of the glue, so does it make sense to start with a higher gram strength formulation to offset this effect? John, the higher the gram strength, the faster the glue sets. Higher gram strengths would, therefore, require more depressant to give you enough working time. Don Williams has also shown that because of the greater percentage of water in higher gram strength solutions, the shrinkage is much greater. That's asking for adhesive failure. Besides... there is such a thing as adhesives being "too strong". You don't want the glue line much stronger than the wood itself or damage like severed tenons are inevitable. The glue line ought to be the sacrificial link in the joinery network. 192 with this amount of salt is a good strength for joinery. Does your supplier sell small quantities of granules......maybe just a couple of pounds? Do the granules have a shelf life? Eugene (bjorn.net) may. I'm not sure. Otherwise order from Tools for Working Wood. As long as they're stored in a mild climate (not in an attic or unheated barn), they are fine. Do you know if urea or salt are already in the mix that Tools for Working Wood sells? It doesn't seem to say on their web site. No depressants are added to that mix. You gotta buy your own. Wow... the Q&A were almost as helpful as the article. Thanks, Joshua, for all the info. Someone asked about weight measures instead of volume. Would it be possible for you to weigh the salt and the glue granules? The amount of material is influenced by how rough or fine the granules are. In cooking, there are distinctly different measures for sea, kosher, and table salt. Also. I wonder if the salt has any effect on screws and other metal parts that come into contact with the glue. Some years ago I made some liquid hide flue and it seemed to work OK. It did, however, taste rather salty. I'd be interested to hear of your experience with salt vs urea. If you follow the first link the post, I show mixing by weight. In my work, it's not critical enough to necessitate weighing though. Don't know about affects on screws. Often screws are rusted on old chairs anyways. Hey Josh, thanks for posting the recipe. I made a half batch, 1/4c glue, 1/4c water and 1 tsp salt, only after the overnight and the cooking when cool it's the consistency of jelly. Do you know what's going on? I'm familiar with Titebond's LHG and like it a lot, I just want to ditch their plastic waste and cost. Yep. 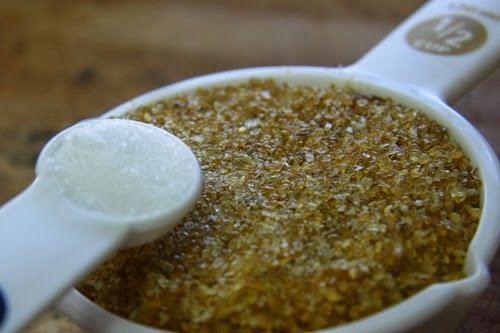 With this amount of salt, you still need to heat it up but the benefit is that is stays liquid longer. If you added more salt it would be liquid at cooler temps but it would also take longer to dry. Thanks a lot for these detailed instructions. 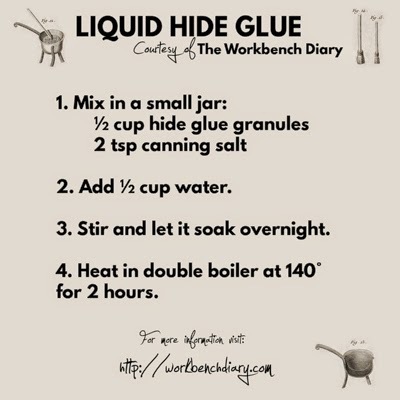 I followed your recipe and obtained a glue that seemed to gel very quickly as it cooled down, not leaving much open time (and not penetrating the wood much either). I was aiming at something closer to Old Brown Glue which stays liquid longer and allows for more fussing with difficult joins. What would you recommend for adjusting the open time? Cooking the glue once again with more salt? Or adding more water? Unfortunately, I could not use canning salt so I used unrefined sea salt. I've never heard of anyone having a problem like that. Perhaps it was the sea salt, but I doubt it. Maybe try table salt. Basically, I'd say add salt until it has an open time about right for what you want to do. Cooking it at 140 wouldn't hurt but it shouldn't need it. Thank you, I will try to add some more salt tomorrow.